The Morgenthau Plan (German: Morgenthau-Plan [ˈmɔɐ̯ɡn̩taʊ ˌplaːn]) by the Allied occupation of Germany following World War II was a proposal to eliminate Germany's ability to wage war by eliminating its arms industry, and the removal or destruction of other key industries basic to military strength. This included the removal or destruction of all industrial plants and equipment in the Ruhr. 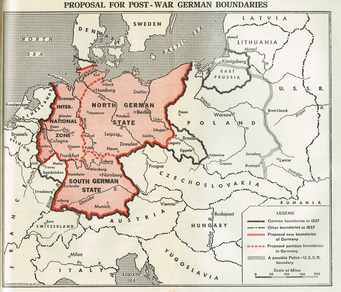 It was first proposed by United States Secretary of the Treasury Henry Morgenthau Jr. in a memorandum entitled Suggested Post-Surrender Program for Germany. The original memorandum, written sometime between January and early September 1944, signed by Morgenthau, and headed "Suggested Post-Surrender Program for Germany" is preserved at the Franklin D. Roosevelt Presidential Library and Museum. According to Morgenthau's son, senior U.S. Treasury department official Harry Dexter White, was influential in drafting the memorandum. Secretary of the Treasury Henry J. Morgenthau Jr. persuaded Roosevelt to write to Secretary of State Cordell Hull and Secretary of War Henry L. Stimson saying that a US occupation policy which anticipated that "Germany is to be restored just as much as the Netherlands or Belgium" was excessively lenient. A better policy would have the Germans "fed three times a day with soup from Army soup kitchens" so "they will remember that experience the rest of their lives." Morgenthau was the only Cabinet member invited to participate in the Quebec Conference, during which the Plan was agreed. Journalist, Drew Pearson publicized the plan on 21 September 1944, although Pearson himself was sympathetic to it. More critical stories in the New York Times and The Wall Street Journal quickly followed. Joseph Goebbels used the Morgenthau Plan in his propaganda. Goebbels said that "The Jew Morgenthau" wanted to make Germany into a giant potato patch. The headline of the Völkischer Beobachter stated, "Roosevelt and Churchill Agree to Jewish Murder Plan!" On 11 December 1944, OSS operative William Donovan sent Roosevelt a telegraph message from Bern, warning him of the consequences that the knowledge of the Morgenthau plan had had on German resistance. The message was a translation of a recent article in the Neue Zürcher Zeitung. The US diplomat James Dobbins writes that an early draft of JCS 1067 had been written while the plan was still understood to be US policy, and "[b]ecause nothing replaced the Morgenthau plan once it had been disavowed, the final version of JCS 1067 contained many of the harsh measures and all the intent of a hard peace toward Germany". However, according to Dobbins, in May 1945 – shortly after its approval in April 1945 – the newly appointed deputy military governor, General Clay, implied that the directive was unworkable and initially wanted it to be revised; after the deliberate loopholes were pointed out to him, General Clay did not press further for a revision but "took great liberties in interpreting and implementing JCS 1067". Clay's good-willed effort did meet obstacles, like General Marshall forbidding him from relaxing the strict non-fraternization to a more reasonable level. Dobbins remarks that the harsh punitive measures shifted toward reform over time as the US faced with the problem of feeding millions of Germans and the Soviet expansion. Gerhard Schulz [de] mentions that the American military government was, until 1947, operating under JCS 1067, which he describes as "a framework that had its origin in the Morgenthau Plan". Georg Kotowski [de] also mentions that "As far as I know the results [of the revisionist debate], it seems to me that, although plans for a policy concerning post-war Germany had been developed as early as 1941, no plan had been adopted by the president that could have served as a basis for a purposeful policy. This resulted in the German question being postponed to after the final victory over the Axis Powers and Japan. At most, the short-lived approval of the Morgenthau Plan by Roosevelt might possibly be seen as a guiding principle of his policy toward Germany, especially since important elements of this plan found their way into [JCS 1067]." Michael Zürn [de] talks of the policy of "Never again a strong Germany!" that found its expression in the famous JCS 1067 (which was influenced by the Morgenthau Plan), but this principle was abandoned by the USA soon after the Potsdam Conference, though it was not until 1947 that JSC 1067 was replaced by JSC 1779 and its related "European Recovery Program". Kindleberger states that "With the termination of hostilities, the mood of suppression gave way to ambivalence – in the West. Germany needed to be punished for wrongdoing, but it was also essential to revive the German economy for its necessary contribution to European recovery. The stern pronouncement of the Joint Chiefs of Staff Directive (JCS 1067) that the United States commander should do nothing to restore the German economy above the minimum level necessary to prevent such disease and unrest as might endanger the occupation forces gave way in July 1945 to an order to stimulate coal production for export delivery to Belgium, the Netherlands, and France" (which did not materialize). In May 1946, General Clay's stop-order on the dismantling of plants (for reparations) marked the first open recognition of the failure of Potsdam. After 1947, when conflicting policies began to be reconciled, economic and social conditions began to be improved. Henry Burke Wend refers to JCS 1067, as approved on 14 May 1945, as a compromise document which, "together with Truman's ascension to the presidency [on 12 April 1945], spelled the demise of the Morgenthau Plan". Despite this, "denazification, deconcentration and dismantling had a profound, if varied, impact on German industrial recovery." Even with the introduction of the Marshall Plan, self-defeating policies that simultaneously industrialised Germany (by investing billions of dollars) and deindustrialised it (through heavy dismantling of its industry) continued until 1948–1949. Walter M. Hudson describes JSC 1067 as less harsh than Morgenthau's plan: while core elements of the Morgenthau Plan were incorporated in JCS 1067, it was deliberately diluted, and permitted the military government to be more flexible than envisaged by the Morgenthau Plan. German historian Bernd Greiner [de] talks of the failure of Morgenthau and the backward-looking political minority that supported him, stating that by the end of 1945 Morgenthau's staff had returned to the USA despondent, and those then in charge were not interested in "industrial disarmament". However, according to Greiner, the "Morgenthau myth" (German: die Morgenthau-Legende) was perpetuated in West Germany by right-wing extremist historians echoing Nazi propaganda and railing against an "extermination plan" for Germany by Jews and the left-wing intelligensia in America, while in Communist East Germany the Morgenthau Plan was presented as a western imperialist plot to destroy Germany. Wolfgang Benz, director of the Center for Research on Antisemitism at the Technical University of Berlin, states that the plan had no significance for the later occupation and Germany policy, though Nazi propaganda on the subject had a lasting effect and is still used for propaganda purposes by extreme right-wing organizations. Benz also states that Morgenthau had romantic agrarianist ideals which might mean that the intentions of his plan could have been beyond preventing conflicts. German historian Rainer Gömmel criticises the common claim by historians, including Benz, that the Morgenthau Plan was never implemented, arguing that core elements of the plan, namely the proposals for deindustrialisation, were adopted in August 1945 and became part of Allied policy. ^ a b Benz, Wolfgang (2010). "Morgenthau-Plan". In Saur, K. G. (ed.). Handbuch des Antisemitismus: Judenfeindschaft in Geschichte und Gegenwart. 3. Walter de Gruyter. p. 214. ^ Kotowski, Georg (1990). "Berlin im Spannungsfeld zwischen West und Ost" [Berlin between the opposing poles of West and East]. In Ribbe, Wolfgang; Schmädeke, Jürgen (eds.). Berlin in Modern Europe: Conference Proceedings [Berlin im Europa der Neuzeit: ein Tagungsbericht]. de Gruyter. p. 449. ISBN 9783110116632. Soweit ich deren Ergebnisse kenne, scheint mir festzustehen, dass in Washington zwar schon 1941 Pläne für eine Deutschlandpolitik nach dem Krieg entwickelt wurden, jedoch kein vom Präsidenten angenommenes Konzept entstand, das als Grundlage einer zielgerichteten Politik hätte dienen können. Dies bewirkte eine Zurückstellung der deutschen Frage bis nach dem totalen Endsieg über die Achsenmächte und Japan. Allenfalls könnte man in der zeitweiligen Billigung des Morgenthau-Planes durch Roosevelt eine Leitlinie seiner Deutschland-Politik erkennen, zumal dieser Plan auf wichtigen Teilgebieten in die Direktive JCS 1067 der Vereinigten Stabchefs der amerikanischen Streitkräfte einging. ^ Reinert, Erik S (20 June 2003). "Increasing Poverty in a Globalized World: Marshall Plans and Morgenthau Plans as Mechanisms of Polarization of World Incomes". In Chang, Ha-Joon (ed.). Rethinking Development Economics. Anthem Press. p. 455. ISBN 978-0-85728-753-3. This page was last edited on 9 April 2019, at 18:56 (UTC).